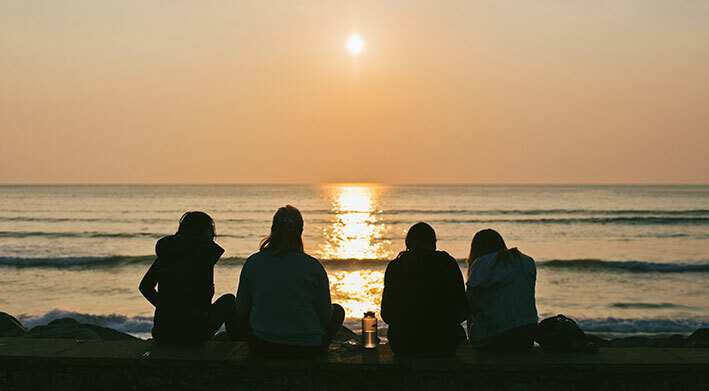 Strandhill is all about adventure – about making the most of every moment with your friends by your side. Strandhill may be small, but it sure packs a punch. Where else can you surf a killer wave in the morning, then learn to fly a plane in the afternoon? Or kick off the day with yoga on the beach, and finish it up watching the sun set from the top of a mountain? 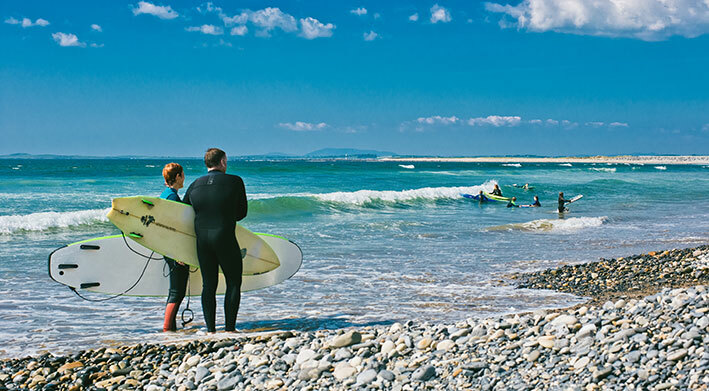 Let’s face it – life in Strandhill is all about the beach. So get yourself acquainted with a stroll along the sand, watching the surfers catch waves and the neighbourhood dogs run alongside the water. Walk along the dunes to the right and you can head out to the beautiful ruins of Killaspugbrone church, or paddle in the still waters of the tiny, sheltered bay. 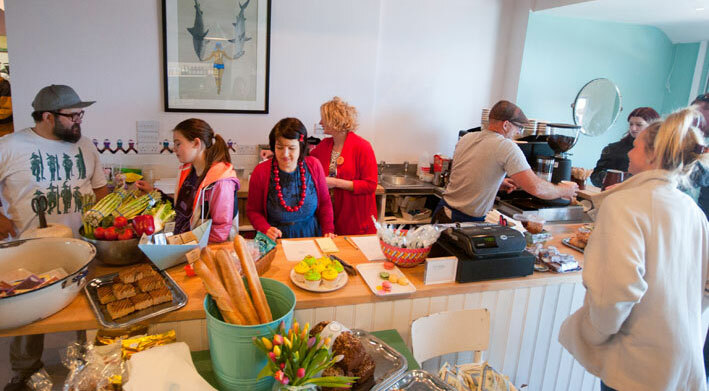 Shells Café is a Strandhill institution, and a visit here is pretty much mandatory. Outside, surfers will be peeling off their wetsuits before popping in for a coffee, locals will be catching up over a scone and the tables will be full of people enjoying a world-class bite to eat. It’s best to arrive hungry – you won’t want to miss their marinated chicken burger with hand-cut chips. People come from all over Ireland for a meal in Shells, and it’s not hard to see why. Nothing beats heading out into the Sligo waters on a lesurely kayak tour. 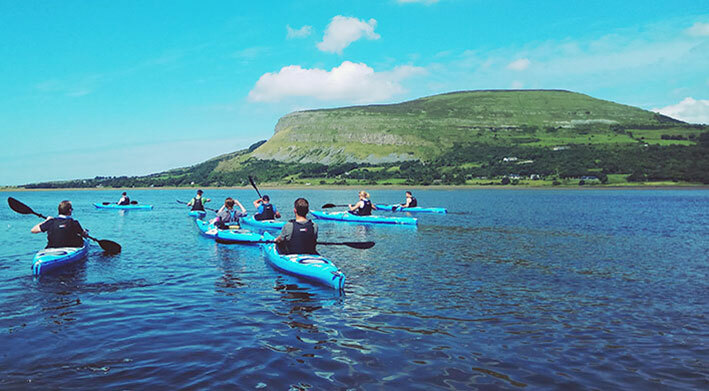 You can paddle out into Ballisodare Bay with Sligo Kayak Tours, where you’ll get an incredible view of Knocknarea, Strandhill’s defining mountain, from the water. Even better? You’ll get a close up look at the seal colony that calls the bay home. Stash your phone in one of the kayak’s dry bags and you might just nab the Insta shot of a lifetime. It’s not hard to find good seafood in Strandhill. And at Stoked, you can tuck into a tableful of small plates bursting with local flavour. Go with a gang and order as much of the menu as you can – you won’t want to miss a thing. 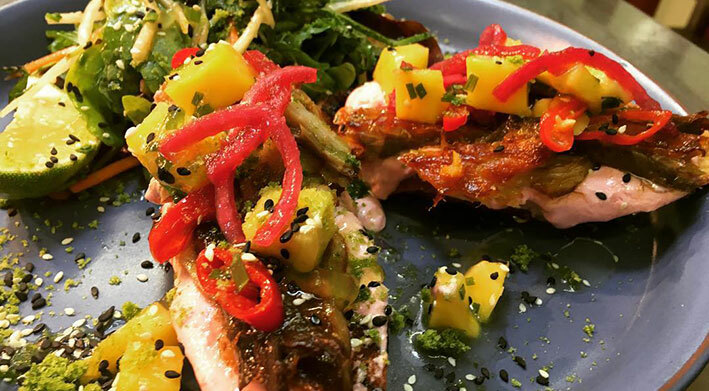 Think smoked mackerel with beetroot sour cream and mango on sourdough, sriracha wings and fresh tuna poke bowls. Get lucky and you might score the captain’s table outside, where you can keep an eye on the comings and goings of the evening. Surf culture is huge in Strandhill. So you’ll definitely want to head out on a board and give it a bash yourself. There are a few local surf schools, where you can rent the gear and head out onto the waves together. And hey, even if you don’t turn out to be the next Kelly Slater, there’s nothing funnier than watching your friends fail to stay upright on a surfboard. If your visit falls on a Sunday, you’re in luck. 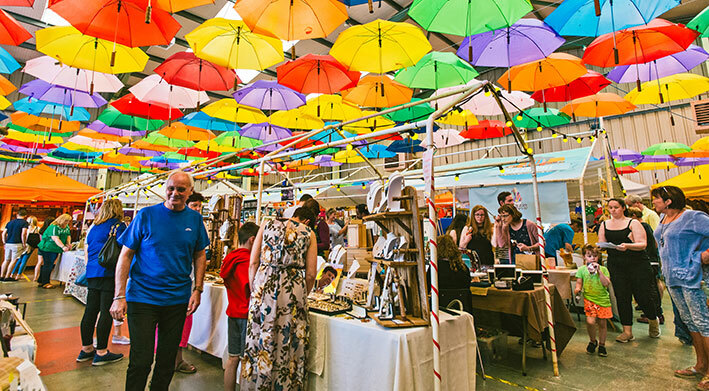 The Strandhill People’s Market is just a short stroll away from the beach at Strandhill Airport. You’ll probably smell it before you see it – the scent of coffee, sizzling Asian food and baked goods waft tantalisingly through the air. Inside, you’ll find a huge selection of foods, along with pressed juices and homemade chocolates, and a variety of local crafts and art pieces. You haven’t practiced yoga until you’ve done it on the sand. With the waves crashing in the background, and the day drawing to its end, nothing beats a stretch to unwind and reboot. 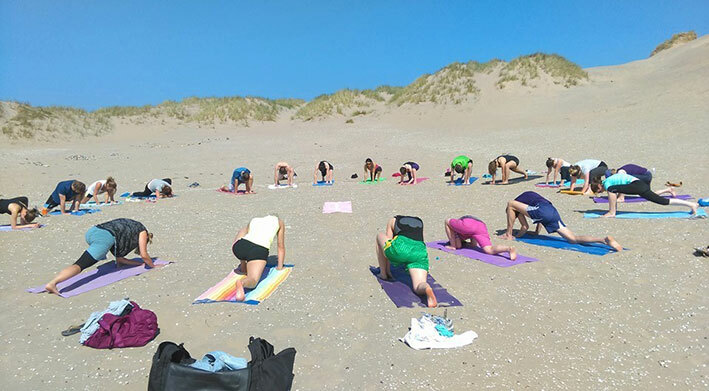 Blaithin Sweeney leads regular classes on the beach, but you can also book in as a group, to salute the sun on your own schedule. Knocknarea overlooks Strandhill from almost everywhere you stand, so a trek up to its peak is essential. Luckily, the new pathway up the side of the mountain makes the climb a cinch, with wooden steps leading you up to Queen Maeve’s tomb. Time your walk to coincide with the setting sun, and you’ll be blessed with stunning views of the bay, bathed in a warm glow. There’s no better way to start the morning. A gentle class at Salt & Soul Yoga Studio will put you in the right mood to start the day, and iron out any kinks you might be feeling after all that surfing and kayaking. 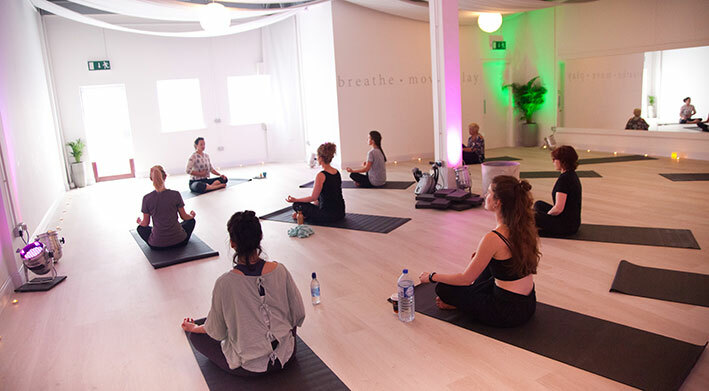 Time your visit right and you can book into a Shells Yoga Brunch – after a morning class at Salt and Soul, you’ll head into Shells for a table laden down with pastries, granola, fruit and a welcome coffee. Rent a bike and cycle around Strandhill and its surrounding countryside – there’s gorgeous beachside scenery in all directions. 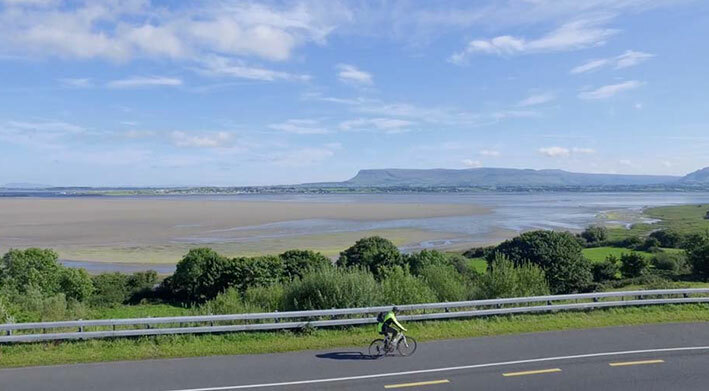 Cycle along the Ballysadare road and you’ll have the ocean on one side, with the foothills of Knocknarea on the other. Or, if you’re prone to a bit of skateboarding, nip along the boardwalk on four wheels. Now, here’s an experience you won’t forget in a hurry. 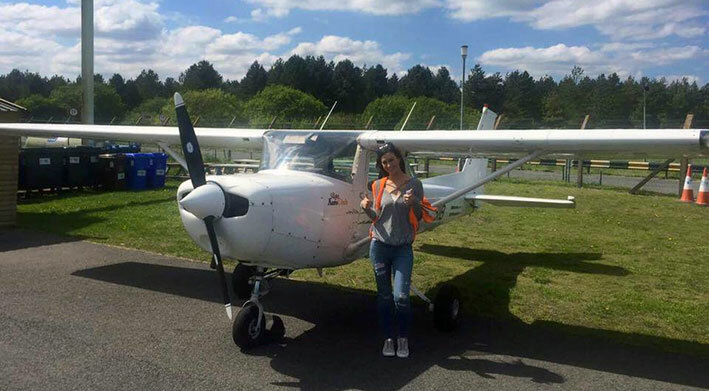 At Strandhill Airport, you can head up into the sky and learn how to fly a plane with Sligo Aero Club. After a lesson on solid ground, you’ll be taken up into the sky in a small aircraft, then take over the controls yourself as you soar over this breathtaking stretch of coastline. 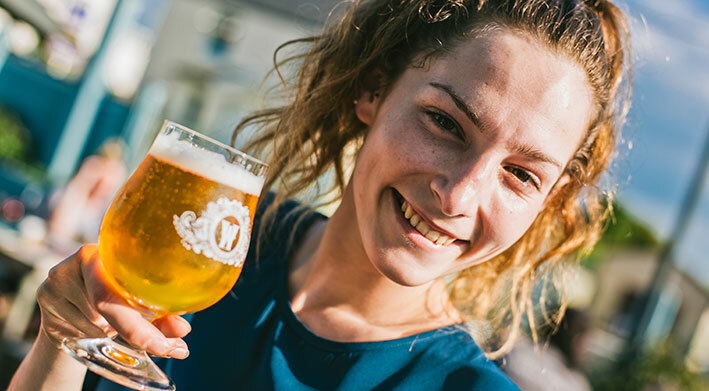 Steady the nerves when you’ve touched down with a craft beer tasting at The Draft House, a buzzing spot in the heart of the village with excellent food and even better booze. There are a huge array of stouts and ales on offer, as well as Irish gins and whiskeys. Afterwards, head to The Dunes Bar – there’s an open mic night held on Mondays.